Turner’s Campo Vaccino Estimated to reach £12 – £18 Million! In 2006, Turner’s painting of Venice called Giudecca, La Donna della Salute smashed records at auction for the highest painting ever sold by a British artist and was bought for £20.5 Million thereby succeeding Constable’s painting ‘The Lock’, which sold for £12.5 Million in 1990. Well, the buzz is back this year as Turner’s Campo Vaccino is set to be sold at Sotheby’s London on July 7th 2010. 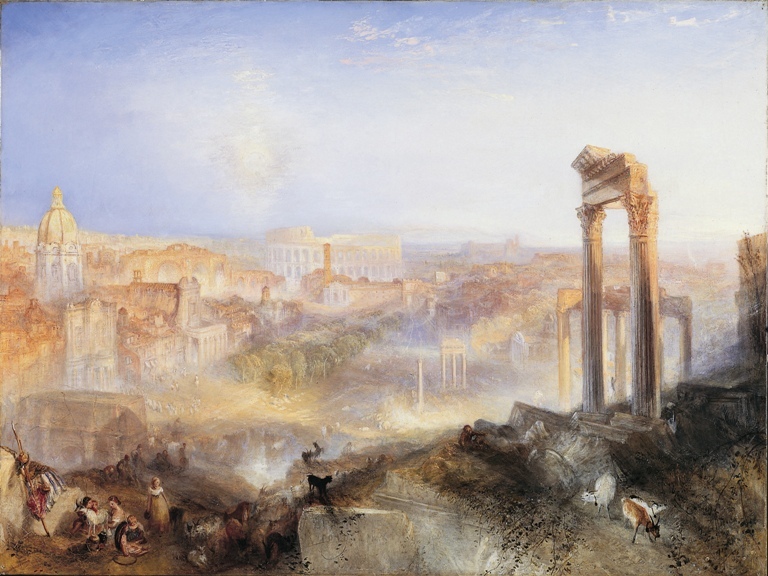 Painted in 1839, Modern Rome – Campo Vaccino is actually Turner’s final painting of Rome and is indeed a monumental work, measuring 90.2cm x 122cm. It brings together all of the studies that he made during his two visits to the Italian capital. Looking at this breath taking painting, I can certainly see what the fuss is all about. If you would like to see it in the flesh, it will be on view at Sotheby’s London from June 4th – 7th & July 3rd – 7th. If you would like to buy a fine art reproduction of it, please visit our Turner page here. Want to find out what it sold for at auction? Would you like to buy a fine art reproduction oil painting of Turner’s Campo Vaccino?